The video below shows a scene from the Halloween classic movie Ghostbusters, which helps set up the rivalry between childish parapsychologist Dr. Venkman and uptight bureaucrat Walter Peck. But it’s also a great example of one of the hidden rules of conversation—and how utterly obnoxious it is when someone breaks them. Dr. Ray Stantz: Everything was fine with our system until the power grid was shut off by dickless here. What’s so obnoxious about Venkman’s reply? The short answer is, he’s deliberately missing the point of the mayor’s question, just to get a childish dig in on Walter. But for linguists, that short answer opens up a whole new round of questions. How do we know he’s missing the point? How do we even know what the mayor’s point was? After all, we can’t ask him, or read his mind, and yet we generally expect any reasonable person to be able to distinguish between the main point—what linguists call the at-issue meaning—and other stuff, details, background information, and so on—the parts that are not at issue. For instance, if I say “My car broke down,” there’s really two pieces of information there. But only the second one is at issue—it’s the main point, the important thing I’m trying to communicate. The first one is not at issue—just background. 1. Any information you get from a description (like ”my car”) is not-at-issue. So if you set up a meeting with someone and they say “The receptionist will buzz you in,” that description lets you know that there is a receptionist—but that’s not what’s at issue. What’s at issue is that he or she will buzz you in. Or let’s say you show up for a doctor’s appointment, and the nurse gestures to someone in a white coat and says “The doctor is running a little late.” That description lets you know that the white-coated person is the doctor—but again, that’s not what’s at issue. What’s at issue is that she’s running late. Knowing what’s at issue lets us make sense of a lot of little ambiguities that come up in conversation. Let’s look at that last example again. You show up for a doctor’s appointment. The nurse gestures to someone and says “The doctor is running a little late.” Now you reply “Oh, that’s too bad.” Which of these things do you mean? It’s too bad that this person is the doctor. It’s too bad that she’s running late. To us, as English speakers, it’s obvious that you mean the second one. But why is it obvious? How do we know? The answer is, we assume you’re talking about what’s at issue. True, the nurse did let you know that that person was the doctor. But that wasn’t at issue, so we assume it’s not what you’re responding to. What was at issue was that the doctor was running late, and that’s what we assume you’re talking about in his reply. Or suppose the nurse says “The doctor is running a little late” and you reply “Why?” It’s the same story. We assume you’re asking about the at-issue part of the nurse’s statement (“Why is she running late?”) and not the not-at-issue part (“Why is she a doctor?”). 2. All else being equal, assume people are talking about what’s at issue. Which brings us back to Ghostbusters. Let’s look at that scene again. There’s a ton of information in that first line that Ray says—at least four pieces. The Ghostbusters have some sort of system. That system has something to do with a power grid. That guy (that is, Walter) is dickless. Everything was fine with it until he shut it off. But only the fourth one is at issue, because the first three all come from descriptions. Walter adds a fifth piece of information, also at issue. 5. They (the Ghostbusters) caused an explosion. So now what is the mayor asking? Most likely he’s asking about the most recent bit of at-issue information, No. 5: He wants to know if it’s true that they caused an explosion. He might be asking about an older bit of at-issue information, like No. 4. But according to the rules of conversation, we must assume that he’s not asking about any of the not-at-issue bits, like No. 3. And that’s the rule that Venkman breaks. Walter already let one not-at-issue insult slide—he didn’t react when Ray called him dickless the first time. 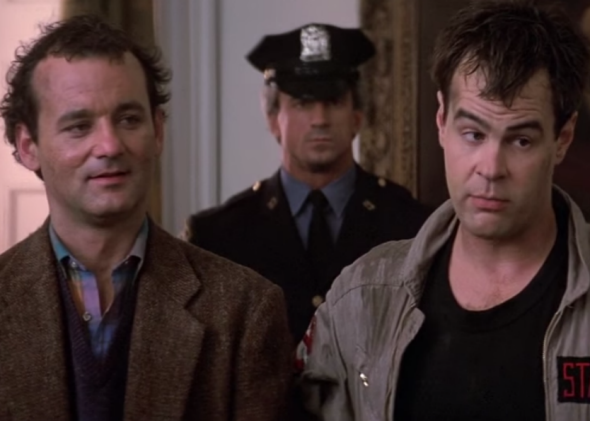 But then Venkman violates the rules of conversation and acts like the mayor’s question was about that insult, just so he can repeat the insult again. And this time Walter loses his cool. You might say that he … has issues.